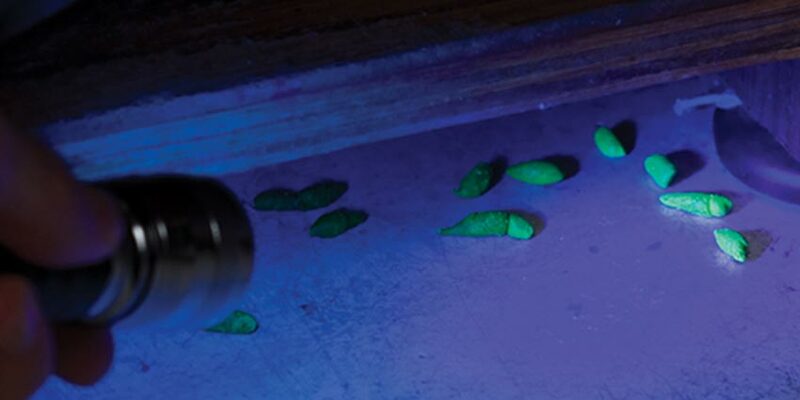 Bell Laboratories' popular rodent bait, CONTRAC, is now available with Lumitrack, a special additive that makes rodent droppings glow bright green under UV light. 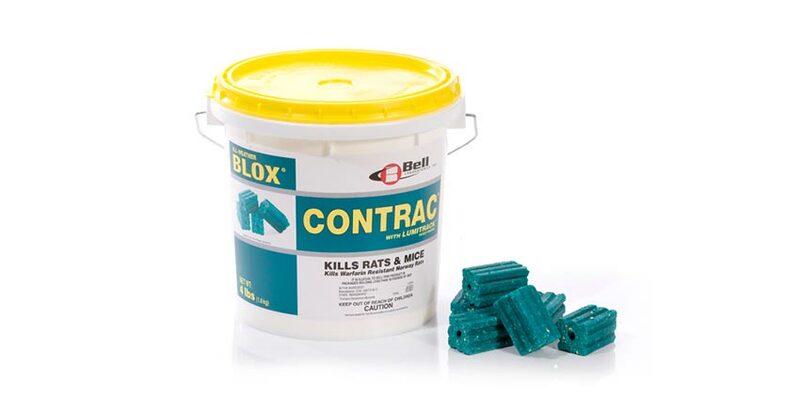 CONTRAC with Lumitrack is a single-feeding anticoagulant rodenticide containing the active ingredient, Bromadiolone. With Lumitrack in the bait, PMPs can quickly and easily identify and track rodent movement. When used as a perimeter bait, PMPs can more accurately determine if rodents are gaining access to a building's interior and, if so, where the access points are located. Identifying rodent's movement gives PMPs valuable insight for establishing additional bait placements or determining where exclusionary or sanitation measures are needed to eliminate rodents. CONTRAC with Lumitrack also helps PMPs track rodent activity in drop ceilings, sub-floors, wall voids and other dark, hard-to-access areas. 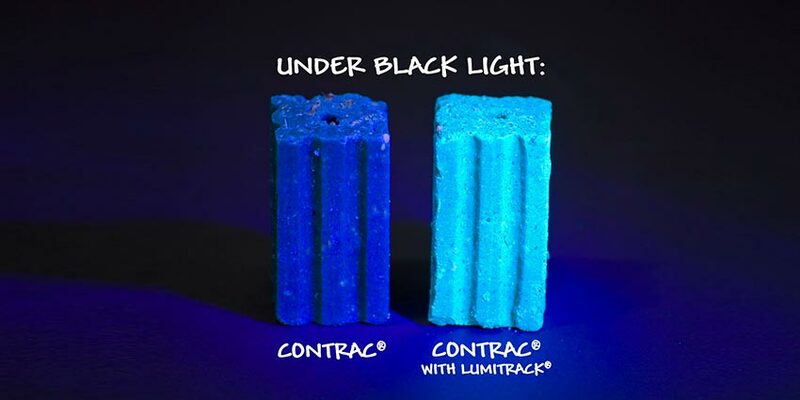 CONTRAC with Lumitrack uses the same reliable CONTRAC formula PCOs have grown to trust, but in addition to Lumitrack, this formula also incorporates a new preservative system that inhibits mold growth even under harsh conditions. For ease of use, a hole in the center of the BLOX lets technicians place it on bait securing rods in tamper-resistant bait stations, or nail or wire the BLOX in place. 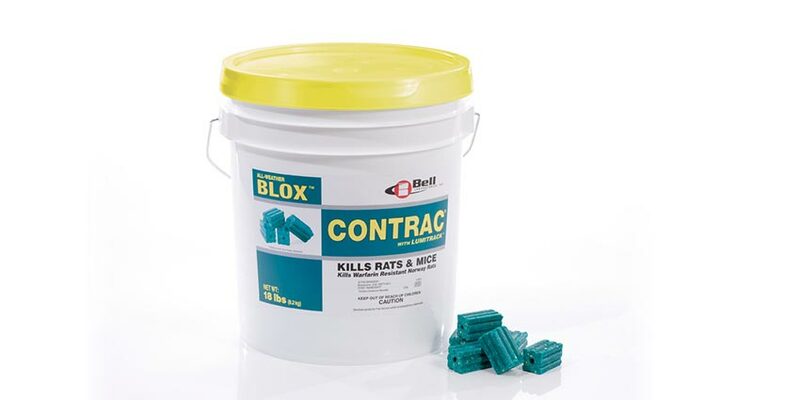 CONTRAC with Lumitrack 28 gm BLOX work well in tight places, nailed to rafters or ceilings, or in Bell's tamper-resistant bait stations. Highly palatable, yet weatherable, CONTRAC with Lumitrack works well in wet and dry conditions. Multiple edges that appeal to a rodent's desire to gnaw. Bait shyness is not a problem with CONTRAC with Lumitrack because mortality occurs a few days after bait is consumed. The antidote, Vitamin K1, is readily available.